Grandpa was left at home all alone and was feeling a little gloomy. So he decided to make a soup. He filled a pan with water, added spices, peas and onions, and waited. Then his granddaughter Ayelet arrived, followed by his grandson Audi and, lastly, by his grandson Yuval. 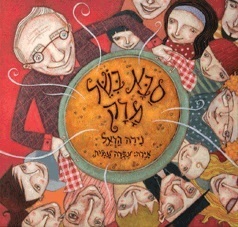 The appetizing smell of the soup attracted all the neighbors and friends, who joined the children at Grandpa`s house. Everyone said the soup was very tasty and remarked how nice it was to eat together. But what do you think happened when Grandpa decided to take a bowl of soup for himself?